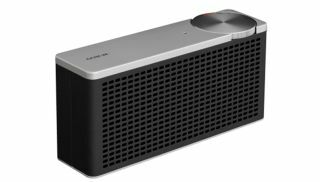 Geneva Lab launches "ultra-portable" Touring/xS Bluetooth speaker | What Hi-Fi? The £135 speaker has a 20-hour battery life and Bluetooth support, as well as a 3.5mm input. If Geneva's latest wireless speaker seems a little familiar, that's because it has been inspired by the Touring S FM/DAB Bluetooth radio it released earlier this year. The Touring/xS is powered by a class D amplifier, with 40W going to each of its two front-facing active drivers and bass being boosted by a rear passive radiator speaker. It weighs 725g and measures 17cm across. It also has a 20-hour battery life, which Geneva says will "outlast any party" (though, Geneva is clearly underestimating our parties). There's also a 3.5mm jack for those who don't want to drain their smartphone with constant Bluetooth use. The Touring/xS uses the Bluetooth 4.1 codec, which will be fine for most people, but we expect Bluetooth 5 to become more popular as it reaches more smartphones. The Touring/xS comes in four finishes ("inky black", "fresh white", "vintage cognac" and "sumptuous red") and will be available in December, priced £135. Don't forget Black Friday is just around the corner, and you'll be able to keep track of all the best deals on our Best Black Friday deals page.